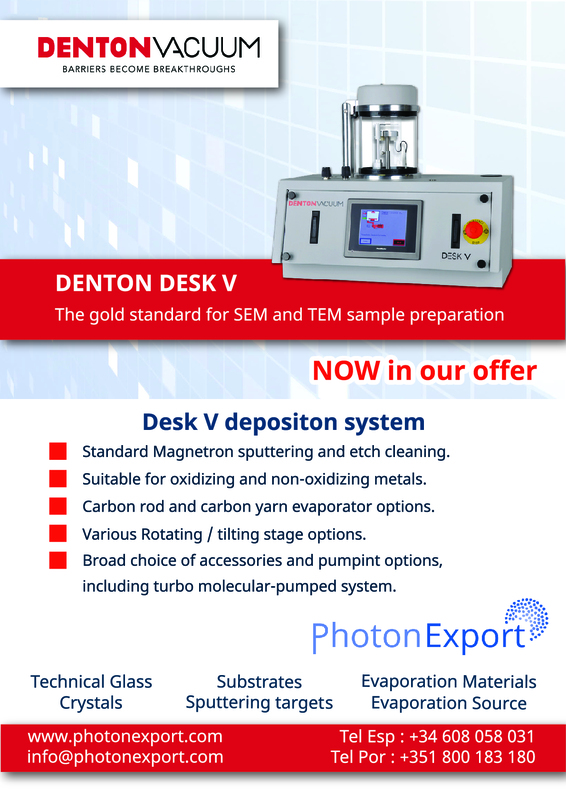 Denton´s Desk V deposition systems are highly productive tools, delivering exceptional, repeatable and consistent results for scanning electron microscopy (SEM) and transmission electron microscopy (TEM) sample preparation. To cover from standard to very demanding needs, two versions are offered: rotary or turbo-molecular pump systems. 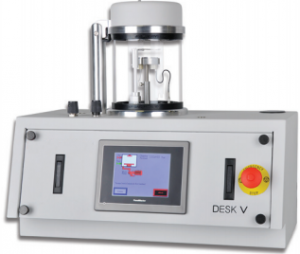 The Desk V HP is equipped with a rotary pump reaching 50 mtorr process pressures for DC sputtering with noble (non-oxidizing) metals, carbon sputtering, carbon fibre coating and ion etching for sample pre-cleaning. A dry scroll or more powerful vacuum pumps are offered for applications where even lower vacuum system contamination or higher vacuum is required. Desk V TSC is the turbo molecular-pumped system, high resolution unit, equipped with stainless steel chamber, suitable for oxidizing and non-oxidizing metals. The unit deposits a conductive layer for scanning and transmission electron microscopy sample preparation and offers magnetron sputtering, carbon rod and carbon fibre coating heads. The Desk V deposits a vast range of materials (including iridium). Highly uniform coatings with superb conformity and coverage are ensured by unique stage design, allowing rotation, variable degree of table tilt and height adjustment from 90 to 130mm for source-to-substrate precise distance control. Thanks to its 6” touch screen, quickly changeable source heads and drop-in, easy to change specimen table and plug and play design, the Desk V is both advanced and easy to use system for every electron microscopist and busy researcher. Pumping, timed etch and sputter process set-points for pressure, power, venting and duration are managed by of the full-color, intuitive screen. The Desk V is capable to store and run up to 10 pre-defined coating recipes, assuring even better consistency, precision, repeatability and uniformity of deposited layers. This cutting-edge recipe programming and storage provides for even easier switching of materials and deposition method for different samples. The Desk V system is offered with various options and accessories to cover every possible electron microscopy need. Vast choice of vacuum systems – from various rotary and dry scroll pumps, to turbo molecular-pumped system with steel chamber, for most demanding applications. A range of specimen stages to meet most requirements starts from static stage and etch table with shutter supplied as standard. For superior sample coverage, tilting and rotating table, and for substrates up to 100mm large flat stage, is offered. Besides the magnetron sputter head supplied as standard, carbon yarn and carbon rod heads are available. For real time reading of thickness there is an optional film thickness monitor.